Fuel cells are electrochemical devices that produce electricity and heat without combustion by combining a fuel with an oxidizer in separate half-cell reactions. Fuel cells are simple in construction, consisting of a “stack” of repeating components. They can be very efficient: hydrogen-oxygen fuel cells have a theoretical upper efficiency limit in excess of 70%. They can be pollution free (when operating on pure hydrogen) and have no moving parts in the stack (although moving air and fuel does require mechanical action, except on the smallest systems). Fuel cells are widely considered to be leading candidates for replacement of internal combustion engines in cars and for distributed power systems. These features would seem to make fuel cells an ideal choice for efficient power generation, but fuel cells are not yet practical. They must jump a number of technical hurdles before being suitable for wide-scale use. For example, fuel cells have strict requirements for reactant purity and can be ruined if these requirements are not met. One type of fuel cell is intolerant of carbon monoxide and can be poisoned simply by the 1-2 ppm of CO present in ambient air. Other issues include cost and durability. The University of Alaska has been involved in the testing of approximately ten fuel cells in the last decade. Despite ideal laboratory conditions, all have failed. Causes of these failures included membrane failure, catalyst poisoning, control system problems, and design flaws. Also, despite their high cost, none of these systems has shown efficiency greater than that of a conventional diesel engine. Depending on design and manufacturer, efficiencies have varied from the low teens to the high 30s. 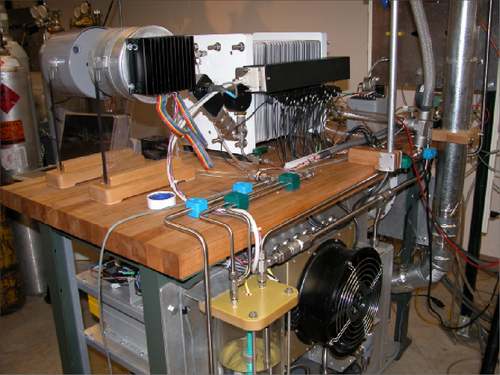 At this time, the only commercial fuel cell available is a 400 kW unit developed by UTC Power. These units are available at a $1,000,000 installed cost ($2,500/kW); however, this product operates only on natural gas, which is not a readily available fuel in most rural Alaskan communities. Even where natural gas is available, the capital cost for the fuel cell unit is higher than the capital cost for a natural gas turbine, and the efficiencies are approximately equal.